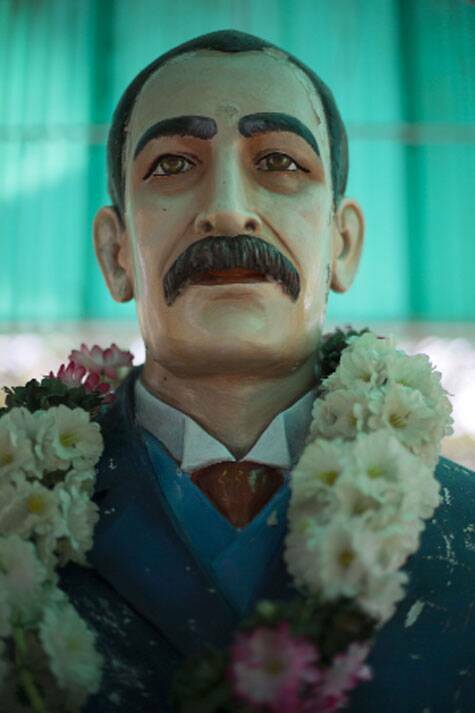 With a fan club, several memorials and induction into the local Hindu pantheon, the legend of John Pennycuick, British engineer and chief architect of the disputed Periyar waterworks, lives on in southern Tamil Nadu. The fabled rice paddies of the Cumbum valley in Theni district, one of the most fertile belts in south India lying west of Madurai in southern Tamil Nadu, are girded by dense canopies of banana, grape and coconut. Here and there, Jersey cows look up from patches of serrated foliage, and rows of onion and beet saplings dance like so many chiffon-clad starlets before them in these bucolic uplands beloved of Tamil filmmakers. The road to Kumili, on the Kerala border, is a ribbon unspooling atop this parcel of green and surging towards the Cardamom Hills, wherein lies the fount of all this bounty: the 119-year-old Mullaperiyar dam, the source of a long-standing conflict between Tamil Nadu, which wants more of its water, and Kerala, which is concerned about the dam’s safety. Last month, in a major victory for Tamil Nadu, a five-judge bench of the Supreme Court upheld a 2006 judgment on the height and safety of the dam and allowed the water level to be raised to 142 ft. The move could mean that farmers in the state, who had settled into a bi-annual cropping pattern and suffered crop losses after the reduction in the height of the dam to 136 ft in 1979, may go back to raising three crops a year. It was amid this wave of hope that we visited Theni, one of five districts — including Madurai, Sivaganga, Ramanathapuram and Dindigul — in the barren rain shadow region of Tamil Nadu that sprang to life with the opening of the 155 ft-high masonry dam in Kerala’s Idukki district in 1895. The spirit of the ruddy, mustachioed Colonel John Pennycuick (January 15, 1841 to March 9, 1911), the British chief engineer of the Periyar Waterworks, bestrides the low hills of Cumbum, which he is said to have surveyed on horseback over a century ago with his local aides, Aanaiviratti (tamer of elephants) Aanaithevar and Kaduvetti (clearer of forests) Karuputhevar. Over the years, legend of his largesse has snowballed and he has been assimilated into the local Hindu pantheon, with farming families offering the first harvest of the year in the form of pongal to a kumkum-anointed portrait of Pennycuick — a balding man in a white collared shirt and a dark jacket, his white-flecked moustache carelessly framing thin lips. The legacy of a man who changed the course of the Periyar river, and the lives of millions of people, with the gravity of his actions and his sheer strength of purpose looms large over Theni. “If it wasn’t for Pennycuick, our fields would be fallow. Over 2.17 lakh acres of paddy, cultivated by 32,000 small farmers, are impacted by the dam. Every day, a crore or more people drink from its waters,” says KM Abbas, president of a farmers’ forum in Cumbum and author of a book on Pennycuick. In Cumbum, says Abbas, children know him as Pennycuick thatha (Tamil for grandfather) and are often named after his associates, a popular name being Logandurai, for ER Logan, who oversaw tunnelling works for the Periyar project. For most of its 300-km length, the Periyar, literally, the Big River, flows through Kerala before emptying — wastefully, according to Tamil Nadu — into the Arabian Sea. Pennycuick’s great ingenuity was that he dammed the river at its confluence with the smaller Mullaiyar river, and diverted the water from the reservoir through a 1.6-km-long tunnel to Tamil Nadu, where it goes on to feed the Suruliyar river and the Vaigai dam. This water then passes through a grid of canals to irrigate vast tracts of land in the state. It would seem that the man who diverted a river from west to east for the first time in India’s history, charted a similar course for himself as he settled down to work at his modest cottage on the dam site at Idukki. Locals say he spoke fluent Tamil, relished biryani and made sure his workers never wanted for food or liquor. When torrents of rain washed away his labour of love three years into its construction, around the year 1890, he is said to have wept and struggled to gather funds for rebuilding the masonry dam in the face of scepticism from the British government. In Palani Chettipatti, a small town near Theni through which a canal of the Mullaiyar flows, a legend reverberates with variations: the Chettiars from the area, locals say, donated liberally to the cause and Pennycuick gave them free access to the waters as a token of his gratitude. In yet another elision between fact and fable, solid gold offerings are said to have been consigned to the river at the behest of Pennycuick ahead of the opening of the sluice gates. We find a scant bit of history in Cumbum at the house of the descendants of Angur Rawther, Pennycuick’s contractor and supplier of labour and provisions. Rawther’s grandson, silver-haired Jafferulla, has preserved records of his family’s association with Pennycuick, including a note of thanks from the Government of Travancore for hosting dignitaries on their visits to the Periyar project. In Thekkady, on the inter-state border, where the language changes abruptly to Malayalam as though we flicked a switch, the Rawthers still grow cardamom on lush slopes dotted with resorts. This side of the border, Pennycuick’s bust is the centrepiece of a well-tended garden facing the PWD bungalow at the Periyar Wildlife Sanctuary, where the artificial lake formed by the damming of the river is an important habitat for elephants and other wildlife. The 777-sq-km area was declared a sanctuary in 1934 and by 1978, it had become Kerala’s only tiger reserve. “All this tourism here is because of Pennycuick and the dam. But Kerala will never acknowledge him,” says a PWD worker, on condition of anonymity. In Tamil Nadu, Pennycuick is both hero and victim. His face has became a trope for the troubled history of Mullaperiyar and a receptacle for political interests after the two states came to a head in the late 1970s. Photoshopped posters of chief minister Jayalalithaa and MDMK’s Vaiko sharing the stage with Pennycuick’s likeness are now plastered on public walls across the Cumbum valley. The Colonel even has his own fanclub, the Pennycuick Rejuvenation Forum led by O Andi of Palarpatti, a village near Thevaram in the Cumbum valley that hosted Pennycuick’s grandson in 2003. In December 2011, Andi led an agitation by over 1,200 farmers against Kerala’s stance on the dam. “We used Pennycuick’s posters to communicate our point of view — that the dam, after it has been strengthened, poses no threat to Kerala,” says Andi, in his dimly-lit home where a wall with a large, garlanded poster of the Englishman is the first thing that meets the eye. “We have been working for a decade to raise awareness about the great man,” says Andi, who began printing and distributing pamphlets on Pennycuick while still in college. “Not many people had heard of him before the Mullaperiyar issue became a movement in these parts. Now he is the face of the movement,” he says. The largest and the latest of memorials to Pennycuick, with a giant bronze statue and black-and-white photographs of the dam, was inaugurated at Lower Camp near Gudalur in Theni last year by Jayalalithaa. It is here that Sanjeevi, 65, and her cousin Maragadham, 57, have come to pay their respects to a man who, they say, “did more than anyone ever could for Tamil Nadu”. “When we heard about the Supreme Court verdict, we set out on this pilgrimage,” says Sanjeevi, who spent her youth gathering forest produce near Gudalur before moving to Coimbatore to find work as a cook. In two days, Sanjeevi will leave for the city, but not before casting a final glance at Pennycuick at the Theni bus stand, which bears his name like so many restaurants, salons and cabs do in the region. “It is believed that his picture brings good luck,” says Rafiq Raja, of Hotel Mullai, a restaurant on the Theni-Kollam highway near Chinnamannur. “He gave us life. This is the least we can do to remember him,” Raja says. Upon retiring from the PWD, Pennycuick returned to England to serve as president of the Royal Indian Engineering College, an institution on Cooper’s Hill near Egham, Surrey, that trained civil engineers to work in India. But for the people of the Cumbum-Theni region, Pennycuick is forever sutured into their consciousness, a flame of aspiration glowing through their darkest and driest years.